Based in Reading, Berkshire and in London, we perform regularly in the South of England and will travel anywhere! .....thank you for the wonderful music.....so many people have commented on how much they enjoyed it.....to have jazz live in my own back garden really made it for me. There was a wonderful moment when I was getting ready upstairs when a few bars drifted up on the warm summer's breeze and surprised me and lifted my heart - I shall always remember that! Whether you're looking for background jazz to provide the perfect backdrop for the drinks reception at your wedding or for an evening dinner party, or if you're looking for an uptempo swing band to get your guests onto the dance floor – or even something between the two - we can help. For more detailed information on our wedding services go to our Wedding Music page. 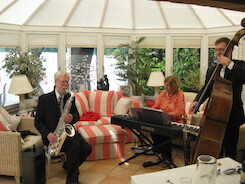 The Abbey Jazz Quartet is led by Jan Steele on tenor sax and includes piano, double bass and drums. The musicians have a wealth of experience with members of the band performing throughout Europe, the USA and Canada and having performed together all over the UK. For background music we can play as a duo or trio, or if you'd like a fuller sound we can add more musicians - for example singer, guitarist or trumpet. We bring our own piano and can provide a PA and basic stage lighting if required. We have a repertoire of hundreds of tunes and are always happy to learn something new if there's a song you'd especially like which we don't already know! For some details of the kinds of songs we play go to our Tune Lists Page. We have played for events as diverse as the topping out celebration for the new Marks and Spencers’ headquarters in Paddington (hard hats and ladders involved! ), a reception for the Prime Minister of Bermuda at the Grand Hotel in Brighton, as well as hundreds of private events, as wedding or corporate entertainment - from christenings to funerals - and everything in between where there is something to mark or celebrate! Besides playing for some really prestigious clients in large venues we have also squeezed into some very small places – such as a client's living room to play for her husband's surprise birthday dinner with just 6 guests – great fun! There’s a list of some of the fabulous places we’ve played at on our Venues page. Our core repertoire consists of mainstream and swing era jazz standards, classic Broadway, bossa nova and Latin. We specialise in the songbooks of Ella Fitzgerald, Frank Sinatra, Billie Holiday, George Gershwin, Rogers and Hart, Cole Porter and other great song-writers and performers. We also have a repertoire of classic Bollywood film songs by the great singers (Rafi, Lata, Anuradha etc) which we can play instrumentally making us an ideal choice for modern Asian events. We can add tabla to the percussion section for this. Our saxophone player is also a clarinettist and for Jewish events we have a repertoire of klezmer tunes – ideal for bar/batmitzvahs and weddings. We are based in Reading, Berkshire and in London. We perform regularly in the South of England and will travel anywhere!